Habitat : Throughout india in the plains and at low elevations. Uses : Roots are diaphoretic, diuretic, expectorant, stimulant. The root is used against bronchites, itch and for bodyaches, for asthma and to cure wounds while the seeds are used to treat toothache. 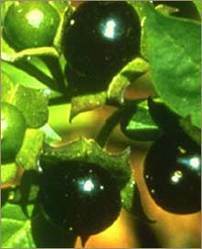 The berries are injurious to children but are often eaten by adults with impunity, especially when quite ripe as the poisonous principle is chiefly associated with all green parts. It is applied in medicine similarly to bittersweet but is more powerful and possesses greater narcotic properties. The leaves are placed in the cradles of infants to promote sleep. It is useful in cutaneous disorders. Their juice has been used for ringworm, gout and earache and when mixed with vinegar, is considered to be good for gargle and mouthwash. Half-ripe fruits are employed in the preparation of curries, chutneys and preserves. A decoction of root is prescribed as a tonic and also used in difficult parturition.